As the rain continues to hammer on the roof of my tent, as it has every day since arriving at Manaslu base camp, I think about the last few days, our first sleeping on the mountain. It’s been a struggle with some tricky climbing at high altitude, but the terrain has been very picturesque, and it’s not been without incident. We set off for Camp 1 on Friday, leaving after lunch when the sky was more likely to be overcast to avoid climbing in the heat of the morning sun. I walked slowly up the glacier on my own, taking as long as I did last time but finding it much easier now that I’m better acclimatised. 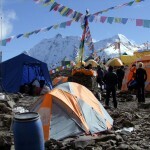 Tents at Camp 1: different colours, logos and sizes. Can you spot the difference? When I arrived at Camp 1 Altitude Junkies’ expedition leader Phil Crampton was not in a good mood. 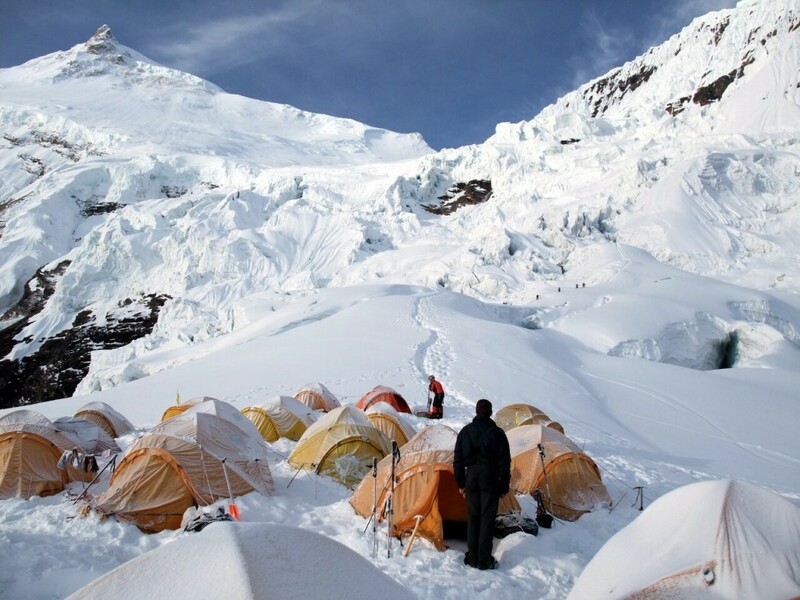 He had arrived in camp to find two French climbers occupying one of our tents. If that wasn’t bad enough they must have climbed in with their packs, poles and axes attached, as there was a huge rip in the front porch, rendering the tent unusable. Their excuse was they had descended in a snow storm and mistook the tent for their own. But this doesn’t stack up. Their tent was badly pitched, a different colour and much smaller, and to put the seal on it, ours contained some of Karel’s kit from the load carry two days earlier. 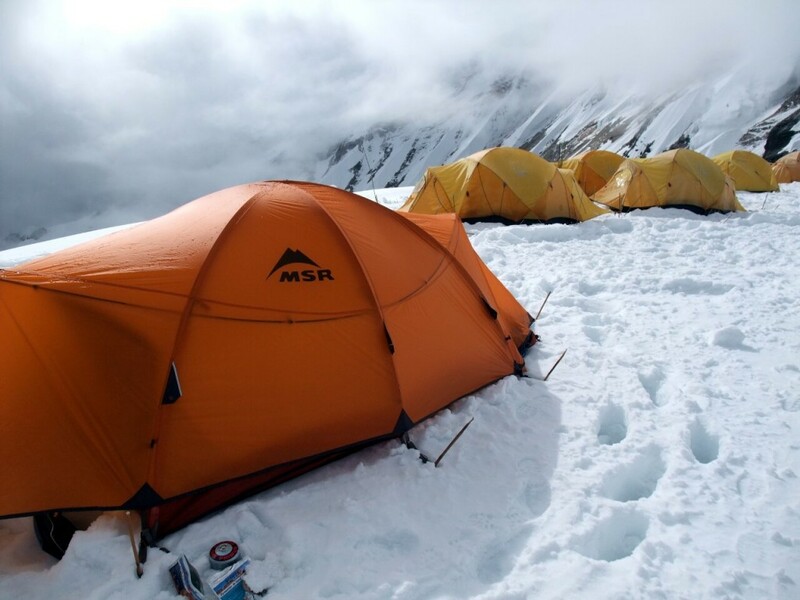 It’s clear the climbers were lying: they saw a more comfortable tent unoccupied and had no qualms about squatting. As a paying client on a fully supported commercial expedition I see things slightly differently. I know I’d be unable to climb this mountain without assistance, so I’m willing to pay for the support I need. I don’t see why the resources I pay for should be used by skinflints who believe they can climb the mountain on a shoestring. Here are some examples. We have a communications tent at base camp with several laptops and an internet connection. We’ve paid for this to be carried for several days on porter back up the Budhi Gandaki gorge, and we’d like the machines and power to be available when we need them. This hasn’t stopped climbers from other teams coming over and expecting to use the place like a high altitude internet cafe. We pay for expensive bespoke mountain weather forecasts to predict the best summit window. Yet the so-called independent climbers hang on them and ascend when we do. The commercial teams are always the ones to put up the fixed ropes. Many climbers contribute rope as payment, but there are many who contribute nothing, yet have no qualms about using the ropes and causing bottlenecks. Many of the shoestring climbers are very naive and get into trouble up high. Always it’s the commercial teams that are expected to carry out the rescue operations, and when they don’t they’re criticised. 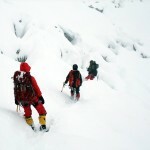 In cases of life and death of course we should be prepared to help where we can, but effectively this means those of us on well-supported commercial expeditions are funding a mountain rescue service for low budget climbers who don’t know what they’re letting themselves in for. I asked Phil whether the French climbers had offered to pay for the tent. “Did they f—,” was his reply. There are always going to be people trying to climb big, dangerous mountains with little support, but I question the mentality of people who think they can take all of the above and offer nothing in return. Apart from this little incident things have been great. Saturday’s ascent from Camp 1 to Camp 2 involved some of the most picturesque climbing I’ve done, through an intricate maze of seracs, zig-zagging from snow ramp to snow ramp, up steep snow gullies, then traversing beneath fluted ice walls like cathedral organs. The first 400 vertical metres were very steep and very tiring, and only eased off coming into camp. But we completed the most technical section Manaslu has to offer in around 5 hours. Above this there is more walking than climbing, and I can cope with this. 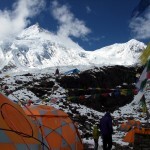 Our night at Camp 2 (6400m) was difficult. We’re following quite an aggressive acclimatisation schedule, having only been on the mountain a week, but we have quite an experienced team and most of us are good acclimatisers. 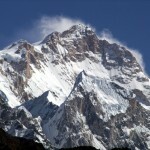 We need perhaps 4 or 5 days more rest at base camp, and then we’ll be ready for a summit push. It’s going to be tough, but there are few summit windows on 8000 metre peaks, so when the first one arrives we need to go for it. This last blog sounds really positive. Hope you guys keep up the spirit there !! How is Mark II ? I have been checking out some You Tube movies about the ascent ; looks fantastic ! !